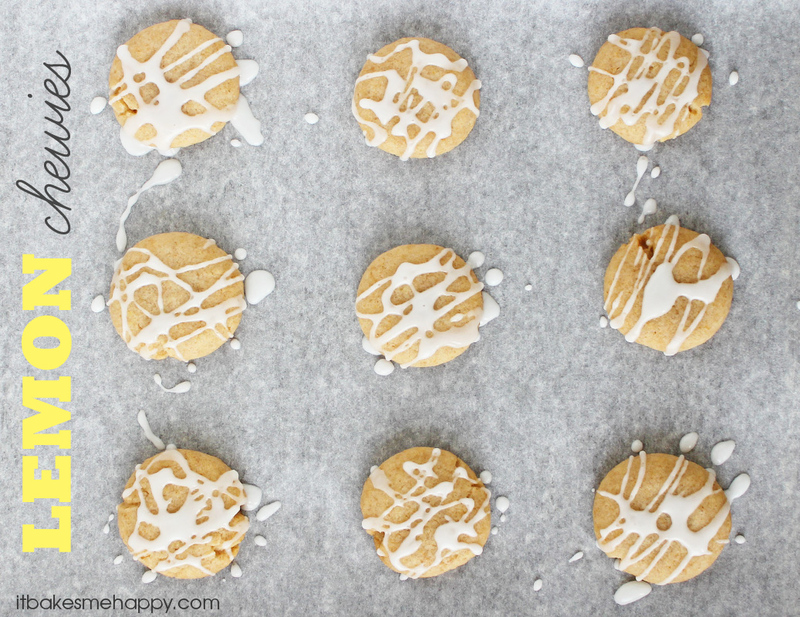 Lemon Chewies are tender, lightly sweet lemon cookies with a tart lemon icing that are dairy free and vegan. I originally shared these cookies back in 2013, but wanted to update the post with new photos and a recipe card and since this month Feast & Devour is all about “lemon” I decided it was the perfect opportunity! The recipe for these Lemon Chewies comes courtesy of The Cookiepedia: Mixing Baking, and Reinventing the Classics “>The CookiePedia: Mixing, Baking and Reinventing the Classics by Stacy Adimando. I am a total sucker for a cute cover design when it comes to cook books, if the bright colors and whimsical design of this book isn’t enough to draw you in, then the “encyclopedic” collection of around 50 cookies, with everything from traditional to fancy cookie recipes will. The original recipe isn’t vegan, but in honor of my sister I tweaked the ingredients to make them egg and dairy free, so if you have a friend or loved one who loves lemon or is vegan/dairy free these are the perfect dessert! I was quite pleased with the results – a lightly sweet, soft lemony cookie that even my cookie obsessed kids approve of. I hope you’ll enjoy them as much as we have, happy baking! In the bowl of your stand mixer cream together the coconut oil and sugar until fluffy, the mix in the lemon oil. In a small bowl combine the flaxmeal and water and let sit a minute to thicken and stir in the honey. In a separate bowl whisk together the flour, kosher salt and baking powder. Add the flax mixture to the creamed sugar and mix to combine, then add the flour mixture and mix until smooth. Scoop 1 tsp the dough and roll into balls, place onto the baking pan and flatten slightly. Bake for 10-12 minutes, until set and lightly browned. Remove carefully from the oven and cool completely. In a small bowl combine the powdered sugar and lemon juice until smooth, but not runny (more or less lemon juice for your desired glaze consistency). Dip the cookies into the glaze or drizzle it over the cookies and serve. Store leftover cookies in an airtight container for up to three days. I am your newest follower! Yay! I have been on your blog perusing around several times in the last few weeks and I was surprised to see that I wasn’t a follower. Well, now I am! Visiting from the Grow Your Blog Hop. These lemon chewies look like wonderful bites of heavenly delight… I love lemon! Just saw your link over at Somewhat Simple’s link party and wanted to come over and check out your recipe! It looks so yummy! And I also love your blog name, lol! Hi Lovely, I’m your newest follower from Weeend wonders #28 blog hop. Love your awesome blog! I’m a little obsessed with the flavor of lemon. These are going on my must-make list immediately (and the book on my Amazon wishlist). 🙂 I’m so glad to have found your lovely blog! The photo in this post is just beautiful…I’m excited to peruse your other photos. You have a new fan (and follower!). I love lemon too! but my hubby doesn’t so I am glad my daughter and her friends enjoyed them as well. I like trying new cookie recipes and especially this one since it is vegan (though I’m not a vegan) which can be healthier than the usual flour and sugar recipes. Thanks for sharing this on Foodie Friends Friday. I think my boys might like these for an after school snack. Definitely one to try!!! Julie they were so good, I actually thought when I made them they would be something right up your alley! Oh these look so good.. Chewy cookies are definitely my favorite and then you add lemon.. YUM! Pinned! Thanks so much for sharing at Weekend Wonders! Hope to see you again on Thursday. Oh, I just love lemon! Delish! YUMMY! I love anything LEMON! I will be adding these to my recipe book! YUMMY Emily!! I love anything LEMON and these look fabulous! Thanks for sharing this at The DIY Dreamer last week. Can’t wait to see what you link up tomorrow evening! Have a great day!! nom nom nom – these look delish! !